An international effort is continuing throughout the night to try to locate an airliner that disappeared on a flight from Malaysia to China. 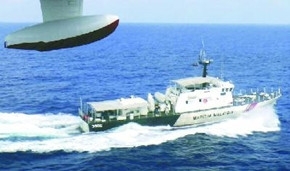 A Vietnamese plane has reportedly seen at least one object in the South China Sea off the country's coastline. But there is no confirmation that it is wreckage from the missing flight. Johnathan head reports from Kuala Lumpur. Two days after flight MH370 vanished from radar screens, the Malaysian authorities still have very little information about its fate. The Boeing 777 was flying at cruising altitude in good weather, and was no radio communication from the pilot to suggest anything had gone wrong. The possibility that the plane may have turned back before it disappeared has prompted them to extend the search area. But no wreckage has yet been found. The focus of the investigation has turned instead to the discovery that two of the passengers were travelling on stolen passports, according to Malaysia's transport minister Hishamudin Hussein. The International Police Organization Interpol said it was too early to speculate about a possible link between the stolen passports and the plane's disappearance. The German Chancellor Angela Merkel has told the Russian President Vladimir Putin that she considers the forthcoming referendum in Crimea illegal. The vote scheduled for the 16th of March will be on whether Crimea should join Russia. She made the comments to Mr.Putin in a telephone conversation involving the two leaders and the British Prime Minister David Cameron. The former jailed Russian oil tycoon in critic of President Putin Mikhail Khodorkovsky has addressed a rally in the Ukrainian capital Kiev. He told the tens of thousands of people gathered in Independence Square that the Kremlin was lying to its own people by portraying the protesters in Kiev as near fascists. There were rallies in several cities across Ukraine throughout the day, most parts are peacefully. But in Sevastopol in Crimea, ethnic Russians beat up some pro-Ukrainian demonstrators. Ben Brown was there. First, they attacked the driver of a white van, smashing his windscreen. He tried to drive through the mob to get away but crashed and was attacked again. Another Ukrainian was dragged into some bushes, kicked, beaten and lashed with a Cossack's whip, we were threatened too by the Russians but managed to run away before they attacked us as well. It was a terrifying moment, and a glimpse of the abyss that Crimea now teeters over. The Pakistani army has set an urgent relief team to the drought-stricken dessert region of Thar in the country's southern province of Sindh. Doctors of the district's main hospital say almost 30 children have did from malnutrition just this month. Thousands of families have left the area in search for food and water. The Pakistani Prime Minister Nawaz Sharif has assured the provincial authorities the Federal Government's full support. The Maldives Supreme Court has sentenced all the members of the country's election commission to six months in prison for disobeying orders. The sentences come at a time when the commission is supported to be organizing parliamentary elections. From Colombo here's Charles Haviland. The four members of the Maldives elections commission were given six months' jail sentences suspended for three years for disobeying orders. The commission's president Fuwad Thowfeek and his deputy have been stripped of their membership of the body. Mr. Thowfeek had criticized the supreme court last October after it annulled a presidential election deemed free and fair by hundreds of observers. The commissioners were brought to trial a few days ago under new rules that allow the supreme court to initiate proceedings, prosecute and pass judgement. Pope Francis has taken more than 18 members of the Vatican's bureaucracy to a modest countryside retreat for a week of pray for Lent. Before setting off, the Pope said Lent was a time to resist worldly temptations like economic comfort and concentrate on life essentials. From Rome here's David Willey. It's Lent, a time of prayer and fast in preparation for Easter. And each year, the Pope and his top advisers normally cancelled all their public engagements and spent a week in.. inside the Vatican. But this year, Pope Francis decided to move the whole Roman leadership of the Catholic Church out of the open hills near Rome for their week of what they called spiritual exercises. They traveled on an ordinary pilgrim coach and another mini bus. There are reports that a group of Syrian nuns kidnapped last year have been released. The nuns were taken by unidentified gunmen from their convent in an ancient town of Maaloula last December after it was taken over by Islamist rebels. It's not clear where the nuns are at the moment, but it's reported that a convoy is taking them to Damascus.